Soleebee Durable badge reel is the solution for storing and presenting name badges in a safe and discreet way. Unique appearance design, add color and interest to your work day! √This retractable badge holder reel is made of resin with high quality bling crystal, very sparkling. √Exquisite camellia appearance design, make you more dazzling. √Our durable retractable nylon wire up to 24 inch/610mm, meet your daily use. √Easily worn from any angle and make your badge straight up at the same time. √You can hold your your collar, belt or trouser expediently, don't have to worry about your badge falling down. √Suitable for teacher, student, nurse, volunteer, perfect decoration for ID badges. √It's a nice gift for your family members or your friends in the special events, such as Birthday, Father's Day, Mother's Day, Christmas or any other similar festivals. Package included 12 PACK Badge Reel. 【12 PACK different color and different accessories badge reels in package.】You could choose different badge reel according to your own clothing, every day has a different style. It's very charming! 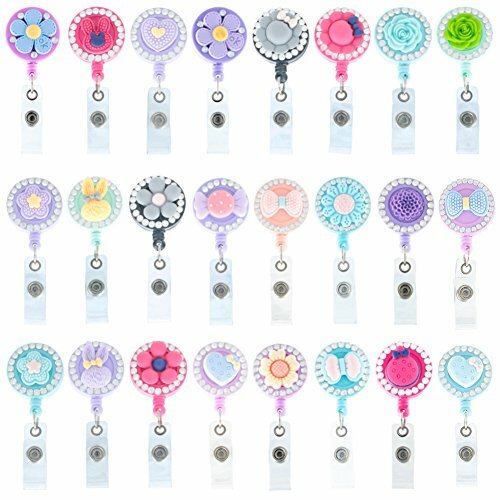 【High Quality】- This retractable badge holder reel is made of high quality crystal and resin, very delicate. 【24'' Retractable Cord】- Up to 24 inch/610mm , retractable nylon wire; weight: 15g, Light-weight and easy to take. 【360 ° Swivel Alligator Clip】- Easily worn from any angle and make your badge straight up at the same time. So you can hold your your collar, belt or trouser expediently, don't have to worry about your badge falling down. 【Attractive Appearance】- Exquisite appearance design, make you more dazzling. suitable for teacher, student, nurse, volunteer, perfect decoration for ID badges. If you have any questions about this product by Soleebee, contact us by completing and submitting the form below. If you are looking for a specif part number, please include it with your message.